Another game I thought I was getting a good deal on a month ago. 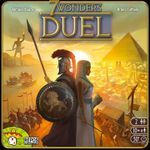 With an 8.2 rating, I don't see 7 Wonders Duel getting much lower than $19.99. If you play much 2 player there aren't many I would pull out before this one! Thanks for the good deal post! $19.99 was the everyday price on CH when I got this. Before the dark times...before the ANA Empire!